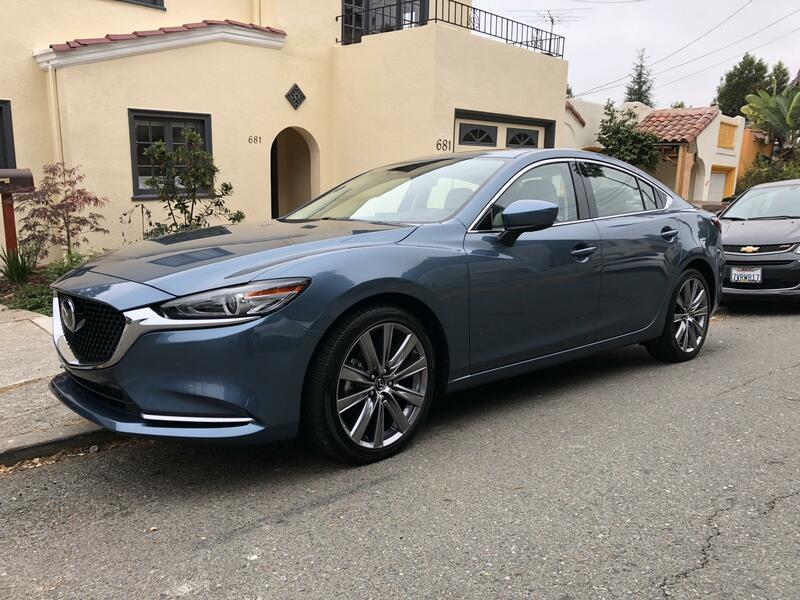 I just purchased a 2018 Mazda 6 with GT Reserve package (blue reflex mica, parchment). I’m loving the car; it drives reasonably well, it’s beautiful, and it’s comfortable. I replaced the stock tires (with some Michelin Pilot Sport 4S, 235/40/19). PS. I owned a 3rd generation RX-7 in the mid 90’s- and loved that car, too. Welcome and enjoy this wonderful car. I replaced the stock tires with Michelin pilot sport 4s's - summer/performance tires (we don't have a winter here in the bay area). They are 235/40/19 - a little wider, and lower sidewall. It rides a lot better with these tires - holds the road and corners with more confidence. Still .. even with the tighter sidewall, I still find the suspension a little too smooth/loose. I'm looking to tighten it up a little, and lower the car a little at the same time. Would aftermarket springs - Tanabe, Corksport, H&R, etc - be sufficient for that? I'm thinking I'd want to lower it about a 1/2" more than typical, to compensate for the smaller tire diameter. Bilstein B6 for the front axle and B4 for the rear. Lower it on Tanabe springs. Don't forget the sway bars front/rear. I am looking at the sway bars. I can't tell whether I'd need/want to do the struts also. But if I do need both struts and springs- for similar expense, I could put in coilovers instead. Then I'd be able to fine tune the suspension and the lowering ... and, lower a little further than the Tanabe springs. Finally, I think coilovers would allow me to adjust the camber, if necessary (instead of a separate camber kit). Is all this right? Shops around the east bay aren't all that familiar with the 2018 Mazda 6, unfortunately, so it's not easy to get upgrade advice from the local Mazda performance experts. PS. I asked Corksport why they don't list their springs for the 2018 model (2013-2017 only). They said the 2018 model is heavier than previous years, and they have to get new springs tuned for that car/weight/etc. They also said one of the owners just bought a 2018 Model 6 GT - they're using his car to try some good 2018 tuning enhancements. They're expecting to have some more 2018 upgrades available, in a few months. You're not being ignorant. Tanabe springs don't offer a very aggressive drop (which is a good thing for performance and ride comfort reasons) Meaning they play nice with the dampening rates of your stock struts. If you want to save money you can certainly do that. Bilstein's with lowering springs cost about the same as a coilover set but honestly, I'd much rather go for the Bilstein's. They are a very durable and long lasting strut, plus they are well designed and would pair very well to Mazda's chassis dynamics as long as you don't get very stiff springs. They will be more comfortable and corner better than OEM. Nice firm but compliant ride - exactly what you are looking for. Coilovers are also a fine choice, but they are only a good option in the hands of a very good suspension tuner, as they need to be adjusted once you install them. And they will not last anywhere near as long. Bilstein's are a one setting type ordeal but will work perfectly for what you need as is. If you just want to save your money, get lowering springs and sway bars. But I would suggest upgrading to Bilstein's while you have your suspension taken apart. As for the Camber, your best bet is to just get Corksport Camber Plates are they are not very expensive and offer more adjustability. They are not necessary unless you like to drive very spirited around corners though.